Last month, a flurry of social media activity suggested that the College of William and Mary was slashing the Africana studies and gender, sexuality and women’s studies departments’ budgets by as much as half. However, data on the allocation of the Faculty of Arts and Sciences budget refutes these claims. Whereas the Africana studies department received approximately $6,000 per fiscal year in education and general funding from 2013 to 2015, it has been allotted an increased base sum of $10,848 for 2016. Similarly, GSWS funding remained consistent around $58,000 over the four-year period, with the exception of a spike in 2014. These numbers do not definitively account for the actual budgets due to transfers that take place in the financial system throughout the course of any fiscal year. For example, Africana studies received a total of $39,794 by the end of the 2015 fiscal year and has already been allocated $13,848 for the 2016 year to date, both of which exceed the number in their initial allocation. Likewise, GSWS has received almost double its budget in past fiscal years, as Arts and Sciences allocates additional funds from their main budget to departments during the year. How these funding decisions are initially made, however, depends on a wide variety of factors. 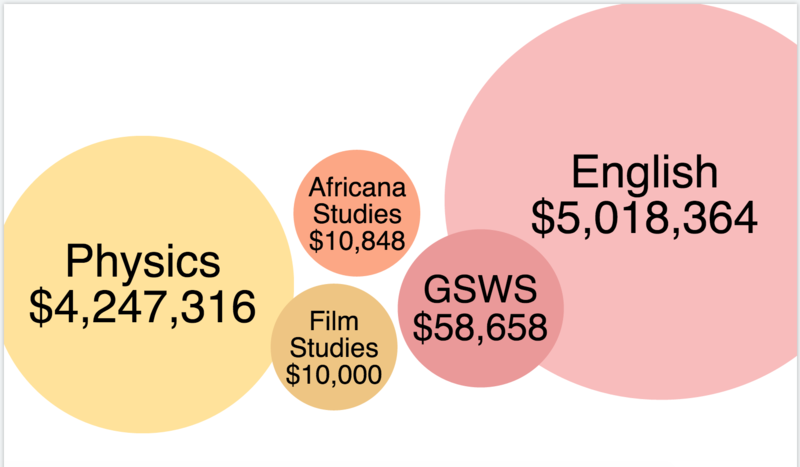 Still, the budgets of Africana studies and GSWS are dwarfed by that of the English and physics departments, which received over $5 million and $4.2 million, respectively, in fiscal year 2016. Director of the Budget Glenda White explained that, because Africana studies and GSWS are interdisciplinary majors, the professors and their salaries are housed within other departments. The money that funds Arts and Sciences’ departments comes from a myriad of sources, such as the Provost, the Finance Office and private funds. Senior Vice President for Finance and Administration Sam Jones ’75 added that the primary sources for the College’s academics are state funds and revenue from students’ tuition. While departments may obtain additional support through private fundraising, they can also request support from the dean. There is some flexibility associated with the salary savings of vacant faculty positions, though the state limits part of the budget to specific uses. According to Dean of the Faculty of Arts and Sciences Kate Conley, her office is as responsive to the budgetary needs of departments as possible. Evidenced by the breakdown of the Africana studies and GSWS budgets, the numbers can change year-to-year. These fluctuations stem from decisions made at the state level to changes in salaries or benefits, such as the addition or reallocation of positions. Furthermore, new initiatives and specific one-time allocations can change funding for departments. Ultimately, according to Conley, Arts and Sciences is successful due to the support both from the Provost and the faculty and staff.